State Origin game 1 : the Blues’ biggest win ever in Brisbane. Home » Rugby league » State Origin game 1 : the Blues’ biggest win ever in Brisbane. NSW have taken a one-nil lead in the State of Origin series after a dominant 28-4 win over Queensland in Brisbane on Wednesday night. The Blues scored five tries to one including four-pointers to giant front-rower Andrew Fifita and returning hero Jarryd Hayne in front of a near sell-out crowd at Suncorp Stadium. NSW can secure just their second series victory since 2006 if they beat the Maroons at ANZ Stadium in Sydney for game two on June 21. James Maloney has scored the first try of the 2017 State of Origin series for the NSW Blues against the Queensland Maroons, as the end the first half on top 12-4. Maloney was in prime position to support a half-break from club teammate Andrew Fifita and scythed through the open field after collecting an offload from the big prop. Maloney then converted his own try from right in front of the posts to give the Blues a 6-0 lead after just eight minutes of Game 1. The try came just moments after a major scare for NSW at the other end of the field, with Queensland winger Corey Oates coming within inches of somehow planting down a four-pointer for the Maroons. Brisbane redemption has been a long time coming at State of Origin level for Mitchell Pearce. For NSW teammate James Tedesco, it was just a fortnight. Tedesco, who endured a miserable night at Suncorp Stadium earlier this month when the Wests Tigers were thrashed by Brisbane, delivered the game-breaking moment in Wednesday's Origin opener. A set after Pearce, who had delivered probably his best game at Origin level, had been taken off concussed following a collision with Queensland centre Will Chambers' shoulder, Tedesco's first try for the Blues blew the game open. 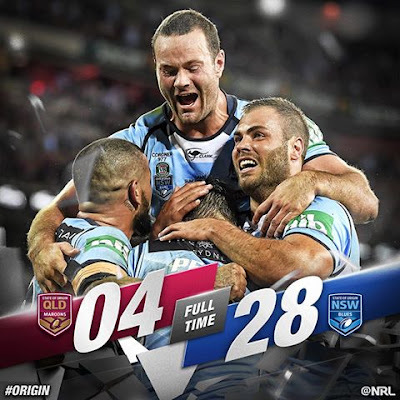 The fullback's clever dummy-half run included a step past Maroons' debutant Anthony Milford, before eluding Michael Morgan and Sam Thaiday to open up a two- try lead which the Blues then used to romp away to victory. Tedesco's try was a fitting moment for a player who had been terrorising the Maroons with almost every carry before that moment. The 24-year-old had racked up almost 150 metres by halftime, every run coming at a speed Queensland found terrifying and near impossible to handle. Whisper it quietly but the Blues' No.1 is also unbeaten in his two-game Origin career - a stat few NSW players can boast in the past decade of Maroons' dominance.